Myriad Genetics said today it will partner with BeiGene to develop companion diagnostics for use with the biopharma’s novel poly ADP-ribose polymerase (PARP) inhibitor BGB-290, through a collaboration whose value was not disclosed. BeiGene has agreed to use Myriad’s myChoice HRD and BRACAnalysis CDx companion diagnostic tests to support the clinical development of BGB-290, a cancer treatment the company is developing under a two-asset strategic collaboration established and quickly expanded in 2013 with Merck Serono, the biopharmaceutical business of Merck KGaA. Myriad's myChoice HRD is the first homologous recombination deficiency test designed to detect when a tumor has lost the ability to repair double-stranded DNA breaks, resulting in increased susceptibility to DNA-damaging drugs such as platinum drugs or PARP inhibitors. BRACAnalysis CDx is an in vitro diagnostic device intended for the qualitative detection and classification of variants in the protein coding regions and intron/exon boundaries of the BRCA1 and BRCA2 genes using genomic DNA obtained from whole blood specimens. BGB-290 is designed to work by selectively binding to PARP and preventing PARP-mediated repair of single-strand DNA breaks via the base-excision repair pathway—thus enhancing the accumulation of DNA strand breaks, and promoting genomic instability, eventually leading to apoptosis. According to BeiGene, BGB-290 has shown favorable PARP1 and PARP2 selectivity in biochemical assays and has demonstrated improved specificity compared to other PARP inhibitors, such as AstraZeneca’s marketed ovarian cancer treatment Lynparza (olaparib), in cell line proliferation screens. 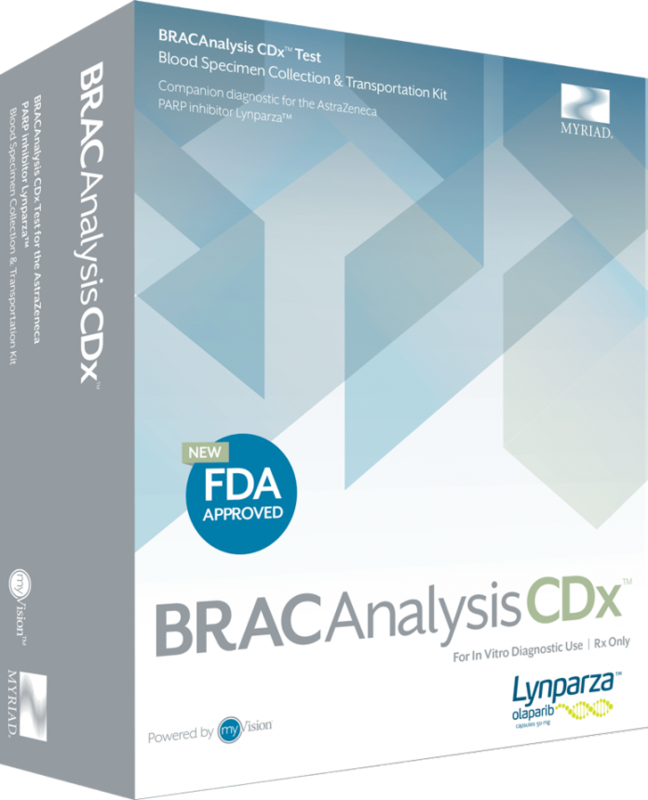 Myriad won FDA approval in December 2014 for BRACAnalysis CDx to be used as the only companion diagnostic in conjunction with Lynparza. At the time, Myriad said it was actively collaborating with several biopharmas to study BRACAnalysis CDx as an investigational companion diagnostic for use with other PARP inhibitors and chemotherapeutic agents, as well as for use in many other solid tumor types. On October 26, AstraZeneca reported successfully meeting its primary endpoint in the SOLO-2 clinical study, which assessed Lynparza in recurrent ovarian cancer patients that were identified with BRACAnalysis CDx. Also late last year, Myriad and AstraZeneca agreed to submit BRACAnalysis CDx for approval by Japan's Pharmaceuticals and Medical Devices Agency in parallel with its review of olaparib, in an accord that Myriad said comes with minimum contract commitments for testing. Myriad also said it agreed with AstraZeneca to perform tumor BRACAnalysis across six Latin America countries. In announcing second fiscal quarter results on February 7, Myriad told analysts on its quarterly conference call it completed its submission of a premarket approval (PMA) application for myChoice HRD to the FDA, for review in conjunction with Tesaro’s PARP inhibitor candidate for ovarian cancer, niraparib (formerly MK-4827), now being assessed in two Phase III studies.